Behold the Baked Taro Chips! We make these anytime we want some sturdy dipping chips. These are awesome to make ahead of time for guacamole, salsa or a great yogurt dip. They are hardy and very tasty, easy to make and a must try. 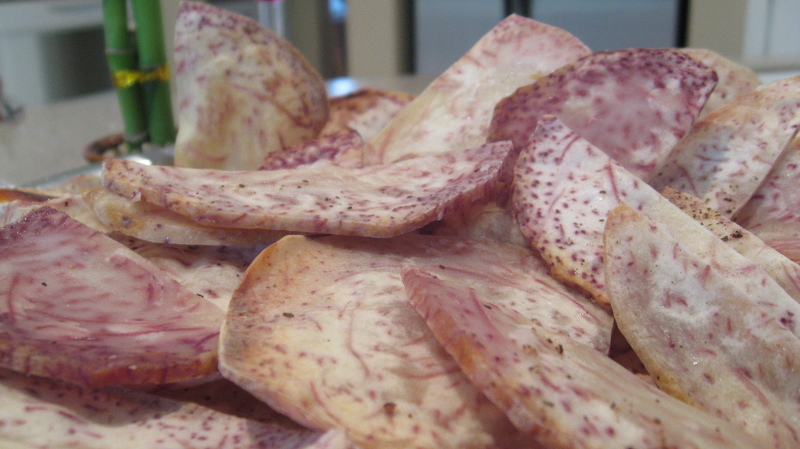 Taro root is a great alternative to potato chips but must be cooked properly to avoid toxicity! Place sliced taro on oven racks or sheets and rotate the baking sheets in position to make sure that all chips cook evenly. Bake for 20 minutes per side, check often to make sure you don’t burn them! I keep checking out the taro root at the grocery store but wasn’t sure what to do with it…now I know. can’t wait to try these! How thick are those slices? You just say thin – but is that thin like a potato chip or thin like a saltine cracker? The slices can be anything you like, but ours were about 2 – 3 millimeters thick. We used our mandolin on level 2. Hope that this helps. Happy baking! Yum…I LOVE taro. I have bought taro chips, but haven’t made them before. So simple and good. Just bought some taro at the Asian grocer. Can’t wait to try this. I’m just wondering if you just eat the chips plain, or do they work well with any sort of dip? These are perfectly delicious plain and even better with a guacamole or Greek yogurt dip. Finally got around to baking these chips today. They are AWESOME!!! Thanks so much for the recipe! My husband was just asking about an alternative to traditional chips. I’ll have to try these. What does the taro taste like? As you can see from some of the comments they taste “awesome”. If you’ve ever had “Terra Original Chips” you’ve probably tried them before without knowing. The best way I can describe them is that they are similar to, but better than a regular potato chip.